"Great tea or coffee cookies, these won't last long in your house!" In a large mixing bowl, cream the butter, white and dark sugars. Beat in the egg, water and vanilla. In a separate bowl, sift together the flour, baking soda, and salt. Blend flour mixture into the butter mixture, and stir well. Wrap dough in waxed paper and chill at least 2 hours. Preheat oven to 375 degrees F (190 degrees C). Grease cookie sheets. Cover each thin mint with 1 tablespoon of dough. 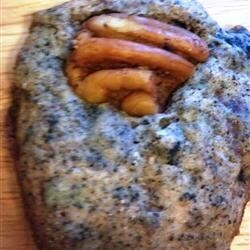 Place on cookie sheet and top with a pecan. Bake at 375 for 10 to 12 minutes. Let cool slightly on cookie sheet before removing to racks. These are some of my favorite new cookies. Easy, simple tasting, quick to disappear! Love these but the dough is always so sticky even after refrigerating for several hours. Any suggestions? This tasted soo good and i got a lot of compliments. Really very yummy. Not that much mint taste though.